"It’s been an amazing journey so far, and I’m so grateful to be a part of it. It’s rare to be able to touch so many people’s lives, and I try to remind myself to make the most of every day and have the biggest impact I can." 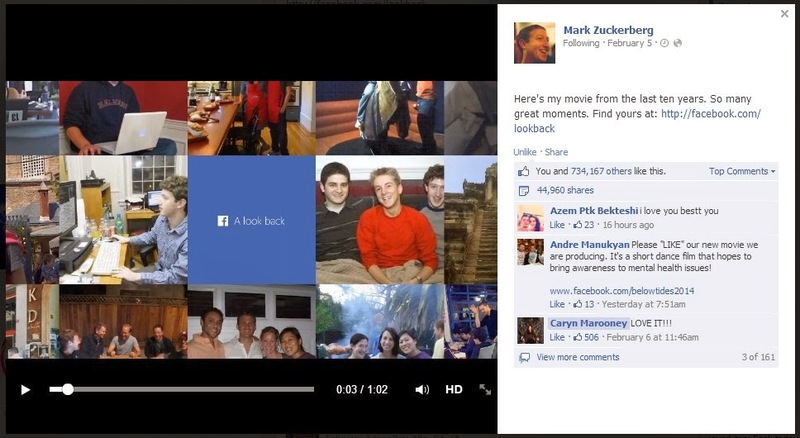 Most of us know by now that Facebook celebrated its 10 year milestone with LookBack, a 1 minute, auto-generated video of your life on Facebook. The photos were automatically selected by Facebook based on popularity, viewership, etc. Many liked but many also complained because the photos included (unintentionally) ex-boyfriends, ex-girlfriends, nasty comments and other drunk messaging, etc. Facebook reacted quickly with a tool that lets you edit out any photos or nasty message posts enabling you to replace with another from the collection. Unfortunately, you are still limited to the auto-selected photos by Facebook (you cannot choose from your entire Facebook photos). Don't fret just yet; This limitation will be changing soon. Be on the lookout for another LookBack enhancement. The Facebook tech team is working on an editing tool that will enable users to remove and replace content to their LookBack video from other photos in their respective Facebook account. In our world of dense network connectivity (i.e., Twitter, YouTube, Pinterest, etc.) and now with Facebook's latest LookBack, do you believe our culture is becoming overly narcissistic? I was actually very happy and surprised by my LookBack. Although I'm not crazy about the fuzzy photo quality or the loooong Facebook intro and ending logos. I try not to spend too much time there but with the latest LookBack, coupled with my curiousity it's very tempting to spend hours on Facebook. How about you? What's in your Facebook LookBack? Photos are from screen captures from my computer, unless otherwise indicated. Photo of FB comments are screencaptures from my FB account.